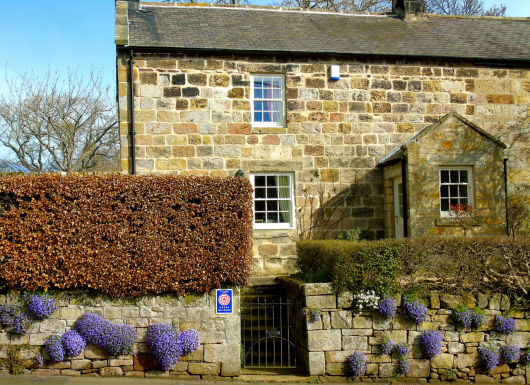 Mill Cottage is a luxury 5-Star Gold holiday cottage in Eglingham, Northumberland. 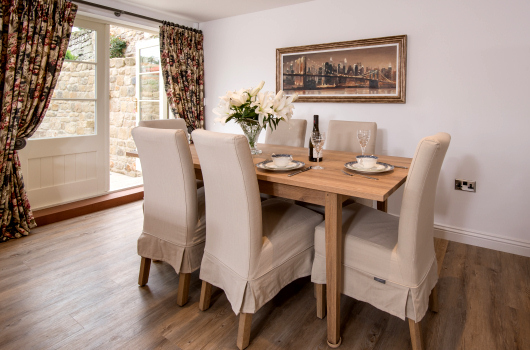 Sleeping two, it makes a perfect retreat for a couple wishing to enjoy a self-catering holiday in one of the prettiest village in rural Northumberland. 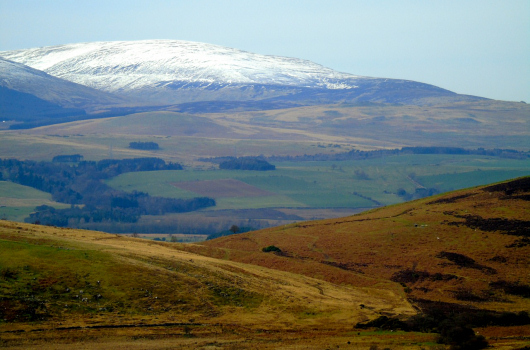 Situated midway between Alnwick and Wooler, our holiday cottage is within easy reach of all of Northumberland's many visitor attractions, including Northumberland National Park and Northumberland Heritage Coast. 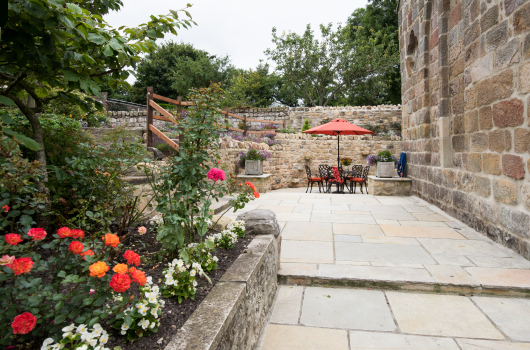 Castles and stately homes in the surrounding area include Alnwick Castle and Gardens, Bamburgh Castle, Chillingham Castle, Dunstanburgh Castle, Howick Hall, Wallington Hall and Warkworth Castle. 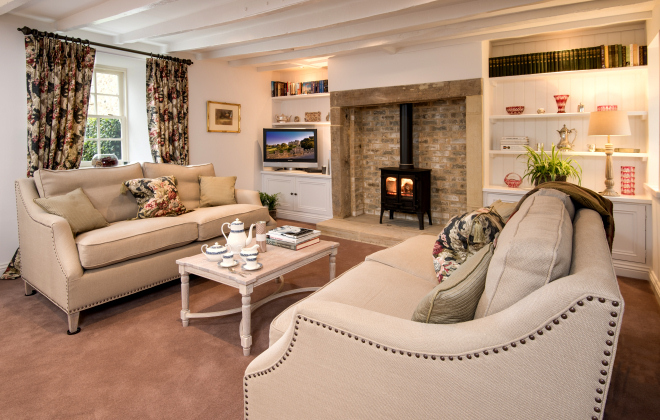 Mill Cottage comprises a spacious living room, with a log-burner and Sky televison; a fabulous bespoke Mowlem dining kitchen with a Rangemaster; and, on the first floor, a delightful bedroom with an en-suite bathroom and shower. Externally, the kitchen leads to a secluded dining terrace and, beyond, to landscaped and more informal gardens. A steep path and steps lead down to the Eglingham Burn, an area with abundant wildlife. 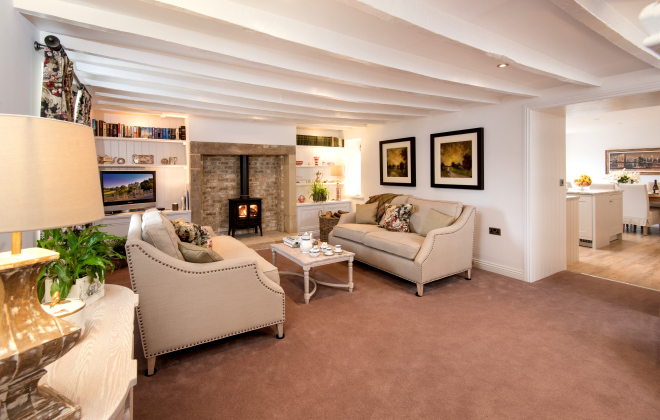 Mill Cottage aims to provide a great base for a wide range of activities. 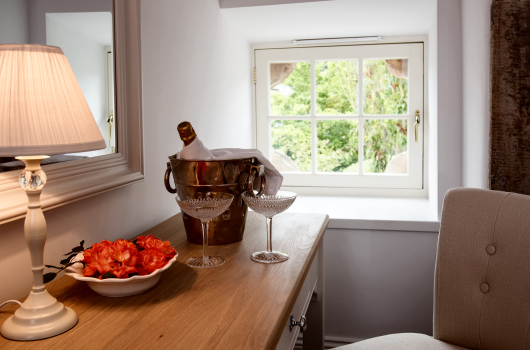 as well as a perfect bolt-hole for those preferring to crash-out without having to leave the village. 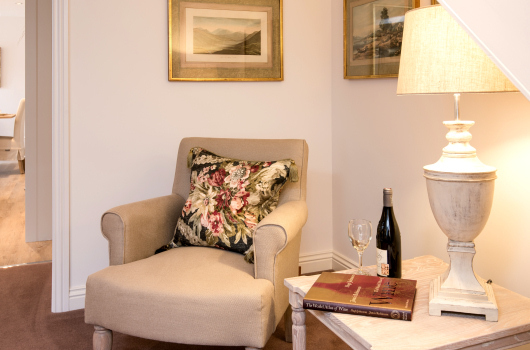 A beautifully furnished and equipped cottage for two, comprehensively redeveloped to the highest standard. 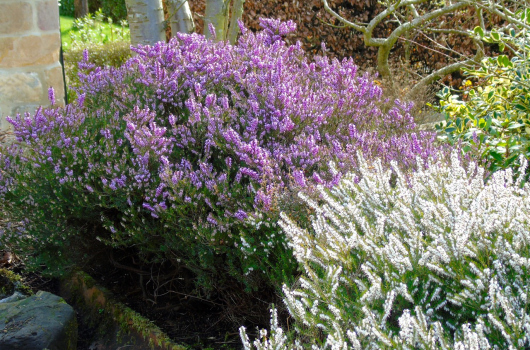 A private site, yet in the heart of a delightful village with a great village pub and restaurant within a short stroll. 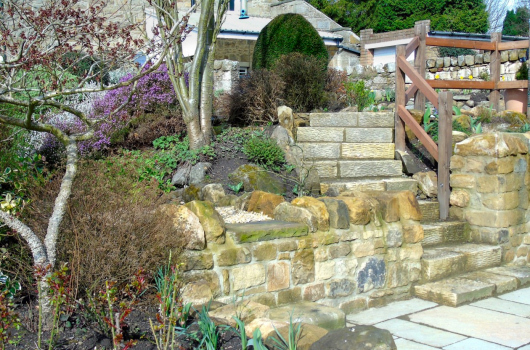 Colourful formal and informal gardens, plus a sun terrace and river frontage. 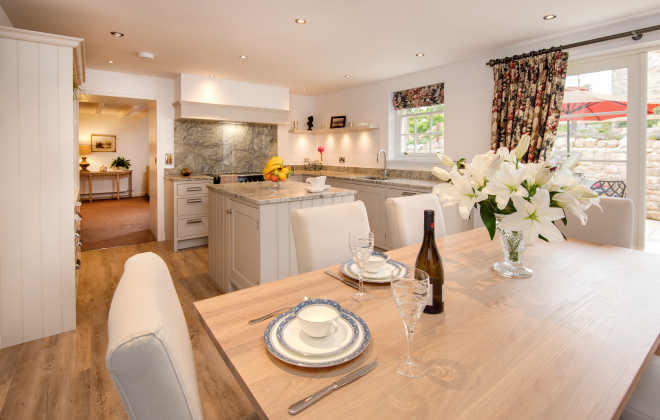 Bespoke Mowlem dining kitchen, featuring a Rangemaster cooker and a dining table and chairs for six. 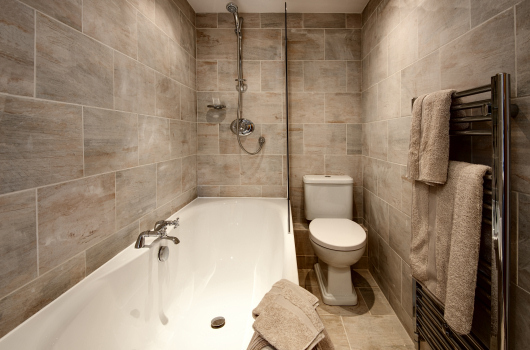 Log burner plus central heating, supplemented by heated kitchen and bathroom floors. Wi-Fi for use with your own smart phone, tablet or laptop. Our prices and availability are always accurate as they are updated automatically as bookings are made. 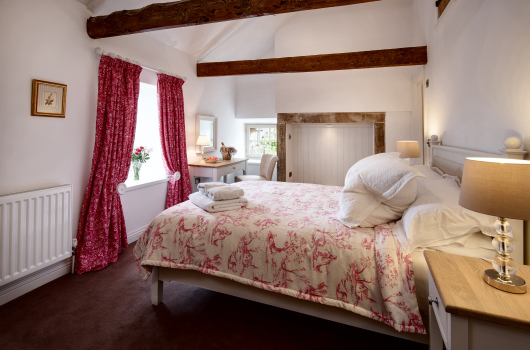 If the holiday cottage and dates you want are shown as available, you can book on-line instantly. You can also book by telephone. Keep up to date with any special offers, late availability and cancellations by joining our free mailing list.